In the year 2045 the world will turn to a virtual world known as the Oasis for pure entertainment and escapism. In the Oasis anything can happen, anyone can be anything, it’s a world without limits. But, when creator of the Oasis, James Halliday (Mark Rylance), dies, ownership and the future of the Oasis is left to hang in the balance. As per Halliday’s wishes the new owner will have to come from within the Oasis by passing three tests to discover his final Easter Egg. Whoever posses the egg will have ultimate say in the program’s future, hopefully carrying things forward with the same intent as the creator. But, evil corp IOI is out to overrun the fun with their own breed of corporate gaming, it’ll take the teamwork of Wade (Tye Sheridan) Samantha (Olivia Cooke), Helen (Lena Waithe), Sho (Philip Zhao) and Daito (Win Morisaki) to keep the virtual world free, but, what if there’s no winning this final game? Directed by Steven Spielberg and based loosely on the novel by Ernest Cline this giant pop culture bomb of amazing proportions sends a massive care package of love to the children of Gen-X who misspent the weekends of their youth in bowling alleys, arcades, or in front of their home consoles playing video games till their fingers throbbed and eyeballs popped out their skulls. An incredibly simple plot at its core, the film doesn’t aim to bend minds or challenge thinking on a straight ahead hero’s quest with a dash of expected love interest; instead, its aim is as true as the games and culture it borrows from, with an intent to entertain, nothing more, check the boxes, mission accomplished. 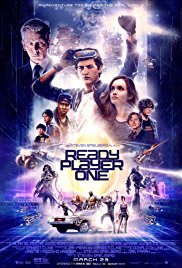 On a technical scale the film spends a great deal of time in a virtual/digitally animated world, to that end, Spielberg is of course no slouch and the visuals are certainly impressive, on an emotional scale though, unfortunately, this is where Ready Player One comes unplugged and soulless. So, it’s a mixed bag, but with the help of nostalgia, and a soundtrack and inspired score by Alan Silvestri enough of the launch sequence has been entered for sufficient liftoff. Ready Player One is rated PG-13. It’s been 10 years since the Kaiju invasion from another dimension was laid to rest on planet earth. Now, an aspiring inventor and Jaeger pilot, Amara Namani (Cailee Spaeny), finds herself in the right place at the right time to meet Jake Pentecost (John Boyega), son of Stacker Pentecost the famed Jaeger pilot who saved the world. More to her amazement, Amara is also enlisted in the Jaeger drift project, a project that’s about to be replaced by drones; meanwhile, a new threat of Kaiju appears to be on the horizon. It’ll be up to Amara and her colleagues led by Nate Lambert (Scott Eastwood), Mako Mori (Rinko Kikuchi), and Jake Pentecost to put an end to the threat once and for all, lest the Pacific Rim crack open once again– It’s Morphin Power Time, Wonder Twins power activate! Directed and partially written by Steven S. DeKnight based on characters created by Travis Beacham (and heavily influenced by Mighty Morphin Power Rangers and Transformers) this calamity of Japanime meets live action comes in smashing like a wrecking ball dulling the senses of the viewer blow by blow in idiocy and Saturday cartoon style melodrama. Wildly uneven in its pacing and built upon a weak foundation to begin with, those craving a new experience or fresh story are destined for disappointment. As a retread of its predecessor and all Japanime before it, finding the thrill is a tall order for this 1 hour and 51 minute assault, an overstay of about 15 minutes that feel like a years. However, for all of its downfalls and detractors, credit and accolades are richly deserved for the visual arts department, technical elements and sound design work surprisingly well, it’s too bad the rest of the story is designed to sap one’s brain power and essence. Pass. 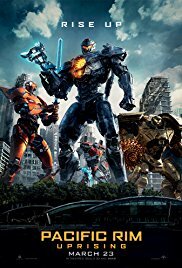 Pacific Rim: Uprising is rated PG-13. 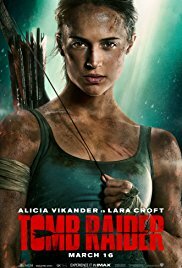 Lara Croft (Alicia Vikander), daughter of the ridiculously wealthy business man/explorer, Lord Richard Croft (Dominic West), happens to be a wildly spirited and independent young woman set on making her own path, free of her family name. But, when misadventure brings Lara back to Croft Mannor, answers surrounding her father’s disappearance seven years ago begin to reveal them self, including clues to the search for a Japanese Queen of Death, perhaps the two are related? It’s an adventure that will take Lara around the world in search of answers high and low, all the while the dark hand of Trinity seems to be at work, watching, waiting…What does it all mean? Directed by Roar Uthaug one has to remember the original source material for this film is a mid 90’s video game, at the time noted for its prominent T&A as much as its action plot. Which, historically speaking, is a formula that’s churned out barn burners like the Resident Evil franchise, the Underworld franchise, or the previous incarnation of Tomb Raider with Angelina Jolie, he says with more than a hint of sarcasm. But woah woah, hold the phone, this go around might actually have some tread to it despite having next to no originality in the actual “tomb raiding” act, sorry, those credits should actually go George Lucas and the crew who wrote the Raiders franchise, so it goes. Yet, even with all of its faults, this pulpy adventure actually manages to bounce from sequence to sequence entertaining just as intended. Vikander is a formidable Croft incarnate, and, sure there are some throw away bits and a few misses; but, one could do a lot worse, exhibits A, B, and C, all listed above. How’s about a roughly two hour matinee for the adventure sake? Tomb Raider is rated PG-13.